Accused attacker ordered held without bond, called "absolute danger to the community"
A Bowie State University student who was supposed to graduate on Tuesday was remembered after he was stabbed to death on the College Park campus of the University of Maryland. News4's Jackie Bensen reports. The young man stabbed and killed in a random attack on the University of Maryland campus Saturday "could make friends no matter what group he was around," his father remembered. Richard Collins III was a competitor and athlete. "He loved lacrosse and soccer. He was a runner," said his father, Richard Collins Jr.
Collins had just been commissioned as a second lieutenant in the Army, and "he prided himself on his time and in his ROTC unit on being the top runner in his PTs," remembered his father. "He even won a certificate for being the best." "He was just competitive at heart, and had a loving and giving heart," the father said, his pain obvious as he spoke about his son. "He would go out of his way, sometimes to my chagrin, to try and help others. But you want to try to encourage that in your children." "He could make friends no matter what group he was around. He was a competitor; he loved loved lacrosse and soccer. He was a runner. He prided himself on his time and in his ROTC unit on being the top runner in his PTs. And had a loving and giving heart." That is how Richard W. Collins Jr., remembers his son and namesake, Richard W. Collins III. The son, who was set to graduate from Bowie State University Tuesday and had just been commissioned as a second lieutenant in the U.S. Army, was stabbed and killed at the University of Maryland campus Saturday. The father sat for an interview with NBC News' Tom Costello. Richard Collins III, 23, died Saturday, three days before he was supposed to graduate from historically black Bowie State University. 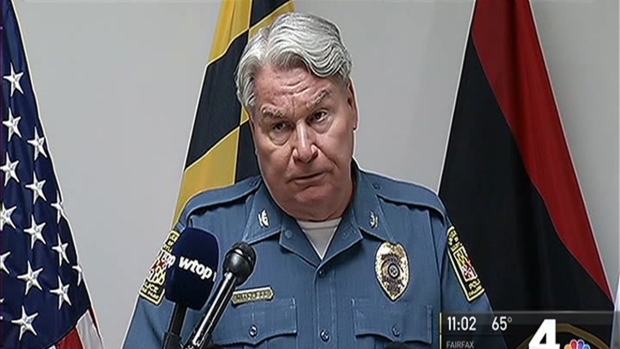 Sean Christopher Urbanski, 22, was charged with murder and assault for the attack that University of Maryland police Chief David Mitchell called "totally unprovoked." In court, a judge held Urbanski without bond at an appearance Monday afternoon. Urbanski's parents attended the hearing. As prosecutors stated the charges, the accused attacker's father closed his eyes. Urbanski appeared on a video monitor, wearing an orange jumpsuit. He did not speak. His lawyer cited media reports saying Urbanski had been intoxicated at the time of the crime. He requested bond, drug counseling and GPS monitoring for Urbanski, but the judge refused. Outside the courtroom, Urbanski's father declined to comment. His mother tried to cover her face. "Fear the turtle" is normally a rallying cry on the University of Maryland campus. 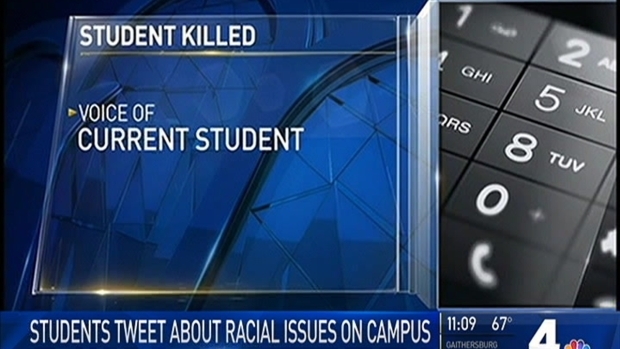 But that hashtag took on a very different tone as students of color tweeting their experiences of racism at UMd. News4's Shomari Stone reports. The University of Maryland police sought the FBI's help after learning Urbanski is a member of a Facebook group called Alt-Reich Nation. "Suffice it to say that it's despicable. It shows extreme bias against women, Latinos, members of the Jewish faith and especially African Americans," Mitchell said at a news conference Sunday. 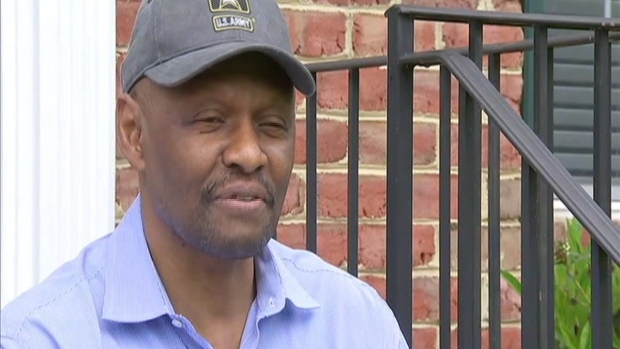 The case is making headlines as a possible hate crime, but the FBI and the Prince George’s County state’s attorney said that determination will take more time, while the circumstances of the crime are investigated first. The FBI said they are assisting in some of the aspects of the investigation. Collins' father told NBC News he was in shock. "I'm in no place to feel very many emotions beside sadness and just a deep sense of personal loss," he said. "A parent's worst nightmare has just reached my doorstep," he continued. Maryland Gov. Larry Hogan expressed outrage on his Facebook page about the attack while sending deepest condolences to the family, friends and college communities. "The individual responsible for this young man’s death must be prosecuted to the fullest extent of the law," Hogan wrote. "Violence and hatred have no place in our communities and will never be tolerated. In the wake of this senseless tragedy, I ask that all Marylanders show strength and come together in this time of grieving." Before Collins was stabbed, he was standing at a bus stop with two friends near the University of Maryland's Montgomery Hall on Regents Drive about 3 a.m. Saturday, police said. Court documents obtained by News4 say Collins was waiting for the university's shuttle bus with his friends when they realized the shuttle bus had stopped running for the night. They decided to call an Uber and were waiting for one to arrive when they heard Urbanski screaming nearby, the documents say. Collins and his friends watched Urbanski approach them. "Step left, step left if you know what's best for you," witnesses told police Urbanski said. Urbanski continued to approach Collins and his friends. Then, he pulled out a knife with a 3- to 4-inch silver blade and stabbed Collins once in the chest, the documents say. The family pastor of the Bowie State University student stabbed and killed on the University of Maryland campus says the family is devastated. News4's Erika Gonzalez reports the victim was an Army lieutenant that was days away from graduating. One of Collins' friends ran toward Baltimore Avenue to call 911 and asked the Uber driver to also call for help. Witnesses helped Collins until police and medics arrived. Two Prince George's County police officers found Urbanski sitting on a bench at a bus stop about 50 feet from where Collins had collapsed. Officers found a knife in Urbanski's front right pocket, the documents say. Witnesses identified him as the attacker. He was taken into custody by the university's police department. 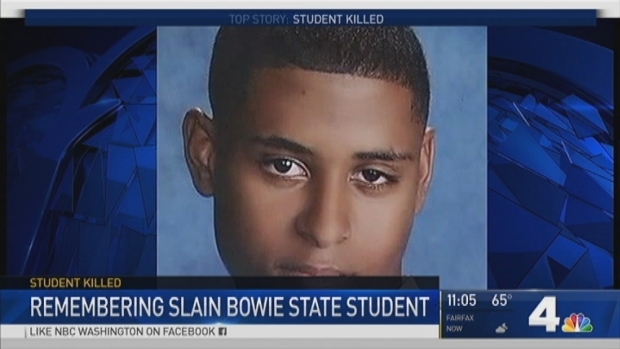 Collins was taken to Prince George's Hospital Center, where he was pronounced dead at 4:10 a.m.
A Bowie State University student was attacked and killed at the Univeristy of Maryland just a day before graduation ceremonies are set to start at both schools. News4's Darcy Spencer reports the stabbing was unprovoked. "It never gets any worse than this," the University of Maryland police chief said. "When I sat with the victim's father, who is a military veteran, and his pastor, and we shed tears together ... I can tell you, it rips your heart out." "Everyone is in disbelief," she said. "He seemed so excited to get to live his life, and he doesn't have that chance anymore." The attack has sparked fear on the University of Maryland campus. "If I'm a person of color, I would certainly look at this as something that could happen to me. In fact, I know on Facebook our students are saying that," Mitchell said. 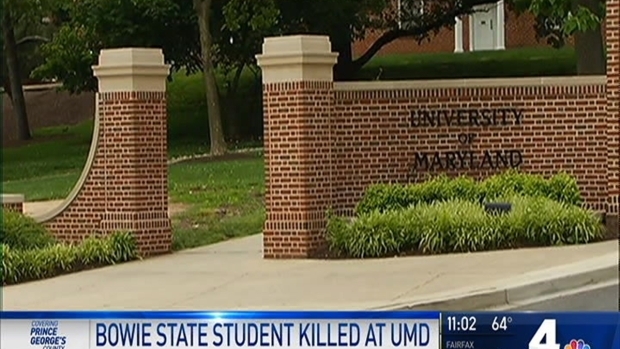 FBI Joins Investigation Into Deadly Stabbing at UMd. The FBI is helping the University of Maryland police department investigate whether Saturday's deadly stabbing was motivated by hate. News4's Darcy Spencer has our report. Campus police have stepped up patrols on and around campus. Dr. Artie Lee Travis, vice president for student affairs at Bowie State University, said the school hopes the investigation moves forward as quickly as possible. "Hate has no place in America,'' he said. "Hate has no place on a college campus, where young minds are coming together to try to change the world." 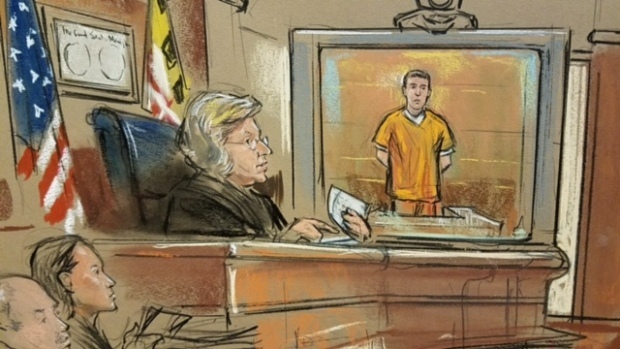 Urbanski, of Severna Park, Maryland, is being held without bond. A vigil for Collins is scheduled for Monday evening on Bowie State's campus. On the University of Maryland campus, flowers and candles were placed at the bus stop where Collins' life was taken.